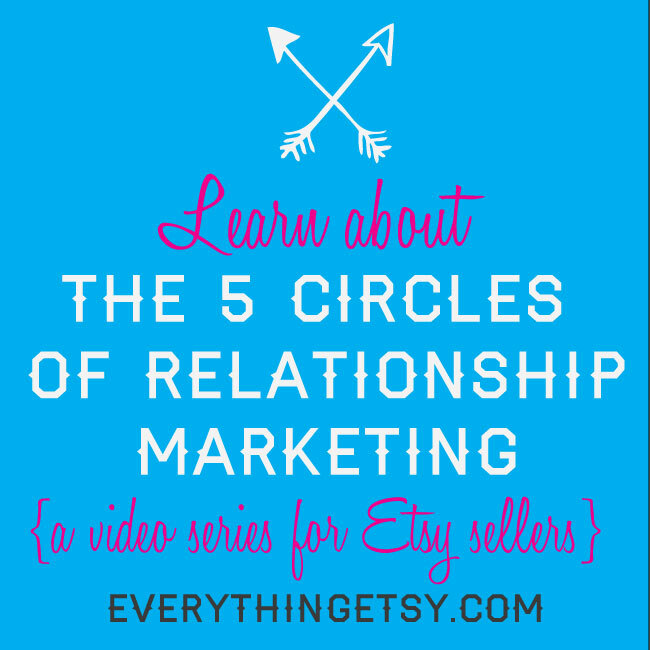 Do you know The 5 Circles of Relationship Marketing? You should because they can help take your Etsy business to the next level! Let us show you a how to look at marketing in a whole new way that will make it easy for you to grow your customers. We started off about 6 years ago with with no budget and an idea. That idea mixed with a ton of work has now turned out to be my total dream job. Now we’ve grown our online business into something our whole family can be part of as we continue to expand. We just moved into an awesome new office to help us get even more done! Don’t forget to look for the downloads available for Video 2 & 3! PS – Thanks for the great response with all the comments on the videos. Keep them coming…we love to talk about Etsy business! I have watched the first three now and I have to say I am impressed and kind of excited I can forget about SEO and just concentrate on the right actions that will give me SEO on a silver platter! 🙂 I look forward to the rest. Thanks! I have really enjoyed the videos and appreciate all of the effort that went into them. My BIG question is…do you have any insight into the new Promoted Listings? Mt eyes glaze over when I try to figure out how to best tweak them. There has been precious little real nuts and bolts info on the forums or from Etsy. I know their intentions are good, but I’m feeling lost!